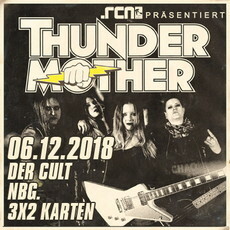 -Direktklick auf verlosung@rcnmagazin.de (Namen, Betreff THUNDERMOTHER und Telefonnummer für eine spätere Gewinnbenachrichtigung nicht vergessen), Preisfrage (Teilnahme freiwillig, ohne Auswirkung auf Gewinn): Eure Postleitzahl? "You guys are great. Love the twin guitar attack and your singer can belt it out without whisky and cigars assisting." "Good music is always good music. Pay attention to the new Rock Queens of Sweden,Thundermother. Great stuff!" "I suggest you get this album. Ever since I got this record my wife of 28 years cannot keep her hands off me!!" "its sounds great!! Awesome energy & good old AC/DC vibe!! yeah!!!" "Cool band and a furious singer!"